There are four kinds of mammal in the world: Rodents, who are the annoying ones; Carnivores, who are the scary ones; Ungulates, who are the tasty ones; and everything else, who are the weird ones. 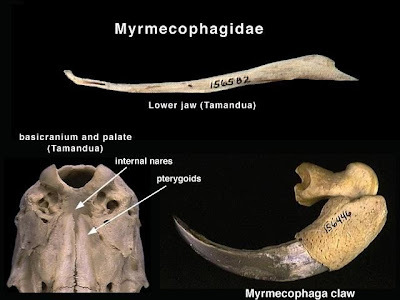 Anteaters are deeply embedded in the weird part of class Mammalia. They're on the side of town where every second house is a commune of hippies and every third one is an art studio. There are only four species of Anteater today, all belonging to the suborder Vermilingua, which means "worm tongue". This in reference to the long, sticky tongue they use to catch ants. 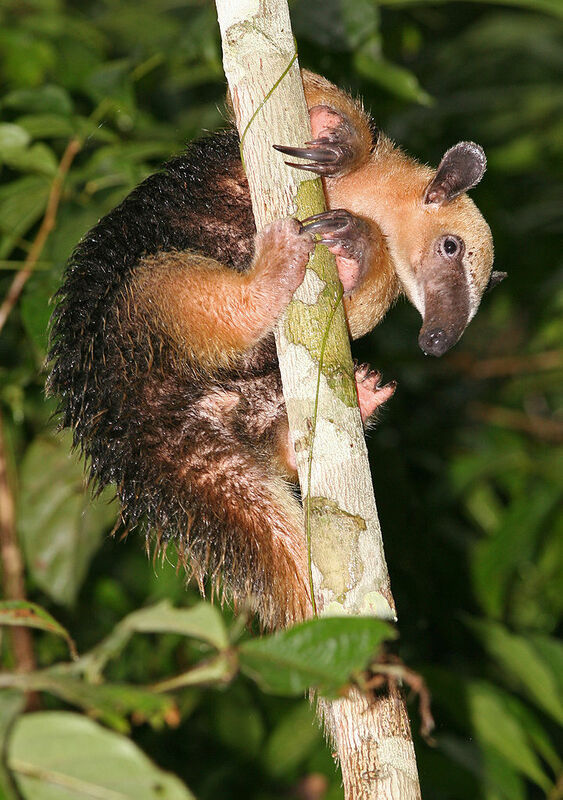 Which they then eat because Anteaters eat ants. It's the "say what you see" school of naming. 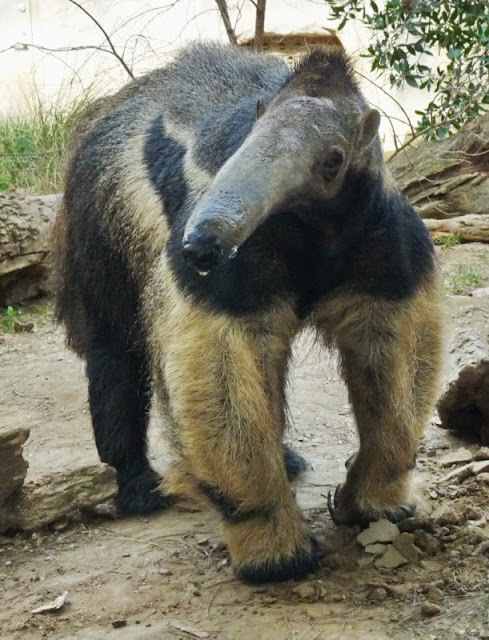 Anteaters are most closely related to sloths and if you add in the armadillos you have the superorder Xenarthra. There is nothing normal in Xenarthra and never has been. Today, armadillos are the only ones who reach up into North America, all the others live in South and Central America only. 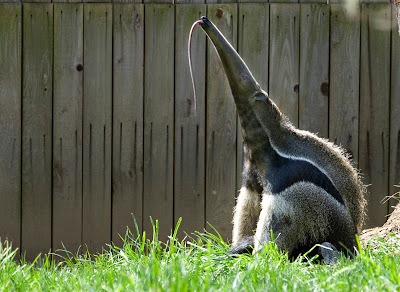 The most famous of all the Anteaters is also the biggest and the only one who lives on the ground rather than in trees. 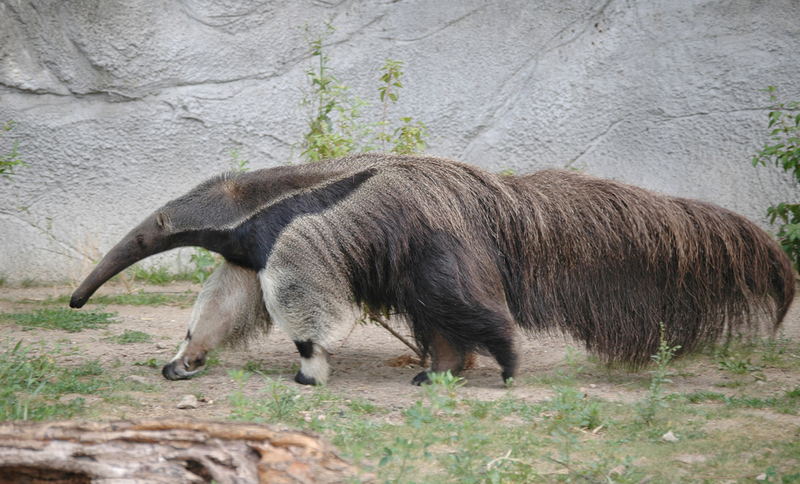 The Giant Anteater is like a modestly sized ground sloth in that respect. Giant Anteaters can reach a little over 2 metres long from tiny mouth to broomstick tail. Like other Anteaters its neck is thicker than its head, like a huge muscle-man. Giant muscle-men may or may not walk on their knuckles, but they probably wouldn't do it to protect their gigantic claws like the Giant Anteater does. The Giant Anteater spends its days tearing open ant and termite nests to sample the contents by flicking its tongue in and out almost 3 times a second. They find them with a great sense of smell since their eyes are small and not so useful. They actually look like they've been reading fine print in the dark too much. And they don't eat carrots so they've only themselves to blame. 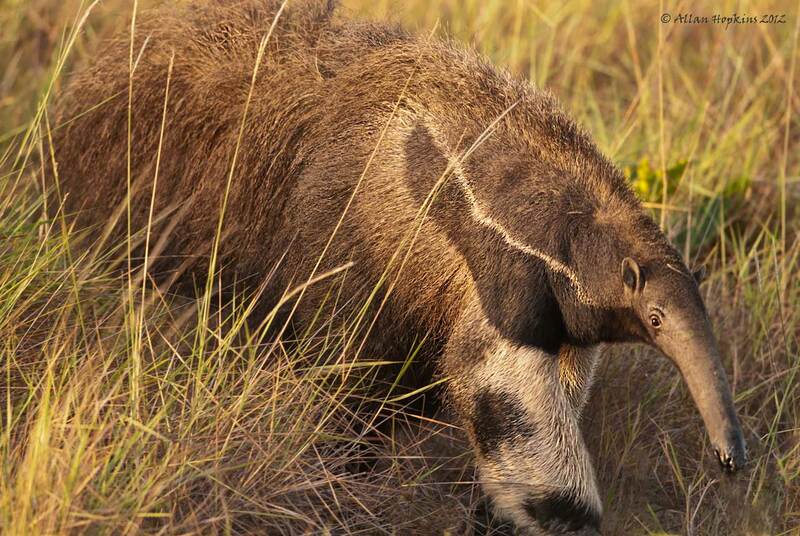 A Giant Anteater's head is about 30 cm (a foot) long while its tongue might be as much as 45 cm (18 in). While they need about 35,000 ants a day to sustain themselves, they only spend about a minute at each nest before they move on. It means they might have to visit as many 200 nests every day but at least don't get bitten and stung too much. Also, the ants and termites have a chance to recover. I guess the Giant Anteater knows all about this "sustainability" stuff; perhaps they've been reading up on it? Ants aren't great as a staple foodstuff. Maybe it would work with some potatoes or bread or something, perhaps some carrots on the side. However, hand me a plate of 35,000 ants and a spoon and I'm pretty sure I would politely excuse myself from dinner. I'd be very impressed, though! Probably watch the ants for a long time, too. Anteaters deal with their decidedly unvaried diet with an extremely low metabolic rate and body temperature. Just like sloths! They don't have teeth and they don't even bother to produce stomach acids to digest their food. They just rely on the formic acid found in the ants they eat. The ants stew in their own juices! The other Anteaters are all much smaller and spend most of their time in trees. 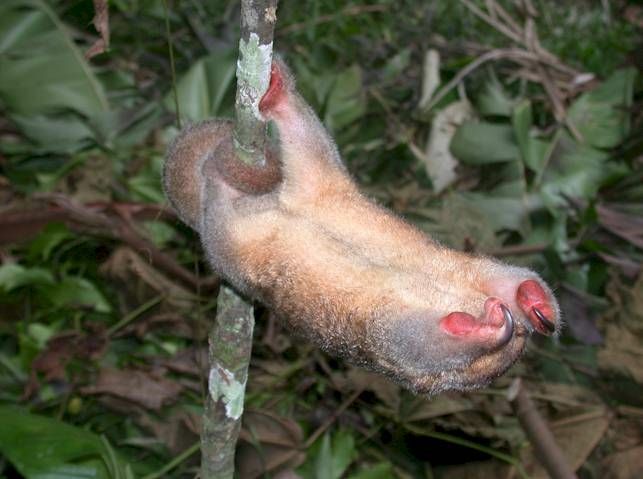 The Silky Anteater is, at less than 30 cm (a foot) long, the smallest of all the Anteaters. It could quite comfortably rest on a Giant Anteater's snout! The Giant Anteater wouldn't like it though, not only because their eyesight is too poor to see how cute and shiny the Silky is, but also because of those evil claws. Silky Anteaters need good claws for grabbing hold of tree branches. Their hind feet have good, long claws, four on each foot. 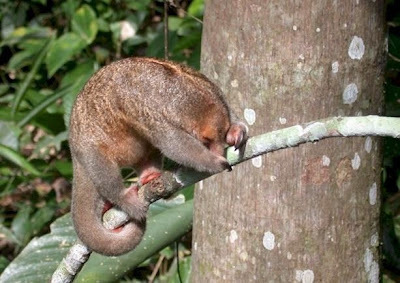 There's also a prehensile tail. Great! The front feet are different. Here there are only two claws, one massive one and one so gigantically massive it makes the other one look small. These two claws are so huge it looks like they monopolised all the space and pushed out the other toes. The third toe is small and has no claw, while the four and fifth aren't actually visible on the outside of the body. It's a kind of strange, claw-based gentrification. Hmmm. 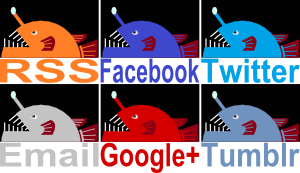 Google turns up very little but there MUST have been a dinosaur with a prehensile tail, right? Surely! 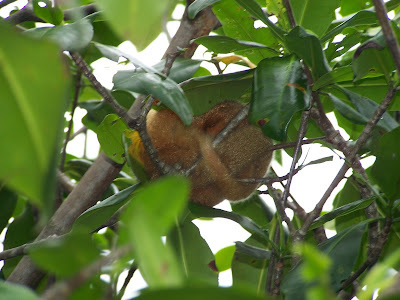 Silky Anteaters are nocturnal and spend their days disguised as bits of tree. Really! They grab hold of a branch and curl up into a ball, at which point they look a lot like the fluffy seed pods of a silk cotton tree. Unless you wake them up and they start punching until they get a coffee. The other two Anteaters are very similar to each other and are known as Tamanduas. 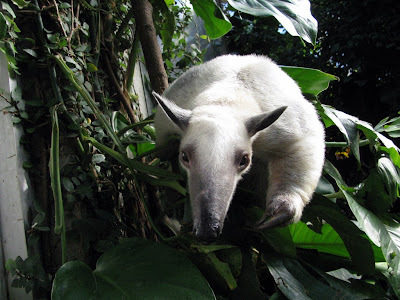 The Northern Tamandua lives in Central America. 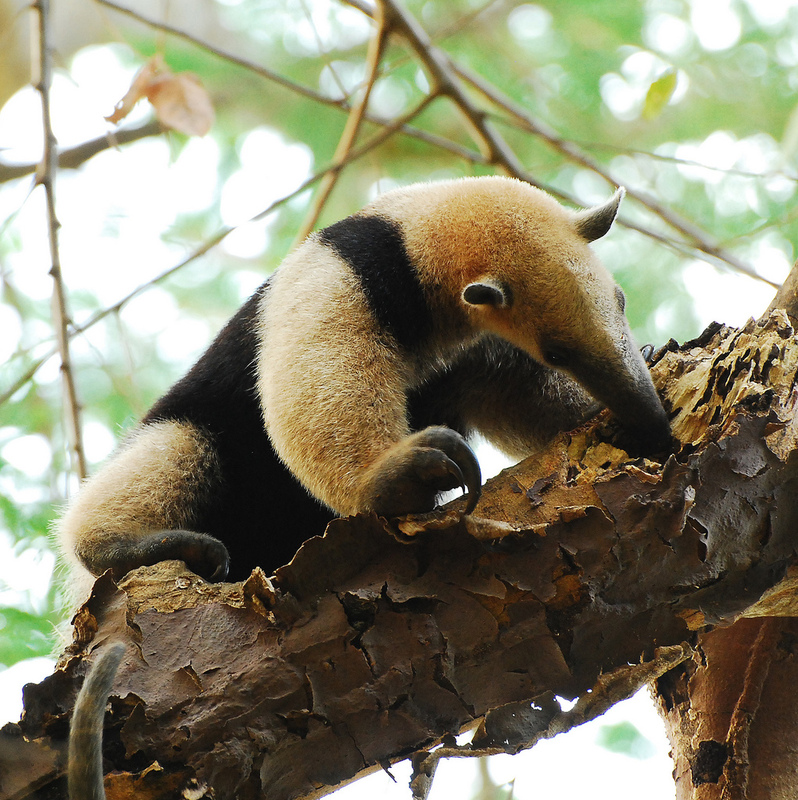 The Southern Tamandua lives throughout much of South America. Unless you annoy them. Then they'll cut ya.
" Hi my friend" This article on ant eaters is really very interesting to read and to see the life of the ant eaters, I feel your writing skills and style very intertaining, my friend your Biology class is really very interesting, I actually got interst in these forest dwelling creatures due to your writing style. I hope to read your blog always with the same enthusiasm. Thanks a lot, Ishrat! I'm glad you're enjoying it! You have to be when you're big but eat nothing but ants!